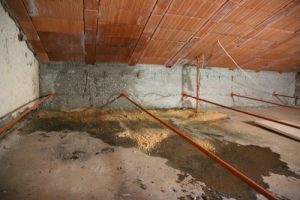 Attic water damage has several potential causes. It usually has multiple consequences, as well. A single incident of attic water damage may necessitate any or all of the following: roof repair, replacement of attic beams, removal of ruined insulation, repair of damaged sheetrock in ceilings below, replacement of carpet or other interior items affected by water, and mold remediation to remove toxic contamination inside the attic. Inspect the roof. Rain water seeps behind split shingles or through leaky flashing. Dripping inside the attic may occur some distance from the actual roof leak however, as water travels along the sub-roof panels and/or attic beams. Dark streaks on the underside of the sub-roof are one indicator of ongoing leakage. Prevent ruptured pipes. Water supply lines are often routed through the attic. In unconditioned attics, frigid winter temperatures can rupture pipes. Insulate all exposed attic pipes to prevent freezing. Inspect for evidence of pinhole leaks as well as seepage around joints. Refer any signs of leakage to a qualified plumber. Control condensation. Water vapor chronically infiltrating from living spaces below accumulates in the attic. Make sure soffit vents and roof vents are unobstructed to optimize passive air circulation. If condensation issues persist, consider adding a powered vent fan at the roof peak. To reduce infiltrating water vapor, seal air leaks in ceilings, around recessed lights and weatherstrip the attic access hatch/door. Maintain attic appliances. In some homes, the water heater is installed in the attic. Flushing the water heater tank regularly per manufacturer’s instructions reduces chances of attic water damage due to tank corrosion and leakage. Where the central A/C air handler is mounted in the attic, a clogged condensate drain line may trigger an overflow. An overflow safety switch can be installed to automatically shut down the unit before water damage occurs. Taking time to inspect your attic periodically and do some routine maintenance can prevent a costly repair bill later. This entry was posted on Tuesday, May 1st, 2018 at 8:41 pm and is filed under Water Damage & Cleanup. You can follow any responses to this entry through the RSS 2.0 feed. You can leave a response, or trackback from your own site.